In 1787, a group of the American elites got together in Philadelphia and fashioned what became the American Constitution. The impact that this document has had upon history cannot be overstated. The details relating to the creation of the blueprint of American government are both historically important and intellectually intriguing. 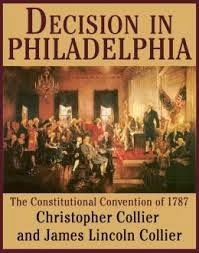 Decision in Philadelphia: The Constitutional Convention of 1787 by the brothers James Lincoln Collier and Christopher Collier has become, since its publication in 1986, something of a classic history book concerning the momentous but contentious event. This work effectively and coherently weaves together an enormously complex story. Multiple issues were debated and resolved by a bevy of great political minds, both famous and not so famous, including George Washington, Benjamin Franklin, James Madison, Luther Martin, Charles Pinckney, James Wilson and many others. The issues and disagreements that drove the Convention were rooted in the great controversies of the time. They included proportional representation versus the rights of each state to be equally represented, state versus federal power, the balance of power between the executive, legislature and the judiciary, national security versus personal liberty and an entire additional subset of issues relating to slavery. It is striking how many of these points are still being debated by Americans in the twenty-first century. The authors handle these convoluted circumstances very lucidly. Instead of telling a completely linear story of the Convention from beginning to end, they take each thread of contention, follow it from beginning to end, and then they move on to the next thread, which they follow from beginning to end. This is not just a legalistic and political history, as the personalities of the various participants are explored and analyzed in some depth. Some new angles on various famous people, such as Washington and Hamilton, are studied. Lesser-known personages, such as Charles Pinckney and James Wilson, both of whom played vital roles at the Convention, are cast into the light. How the particular traits of the individuals involved affected the final product is also explored. As I often do I would like to discuss just one of many themes highlighted in this book. One thing that impressed me about this work was that while the authors acknowledge the remarkable accomplishment that the fashioning of this document was, they are not hesitant to criticize aspects of the final outcome. These days, many people, understandably, express an awe concerning the American Constitution. Here the authors manage to exhibit some of this awe while at the same time displaying an analytical and critical hard headedness. This document, for all its virtues, was like anything as complex - a flawed document. As is generally known, the Constitution implied the legality of slavery. Under the Constitution, the importation of slaves was permitted for twenty years, slavery was allowed to expand into the American West and slave owners were allowed to pursue escaped slaves into the North. Historical commentators from every quarter often castigate these terrible facts. The Colliers dig a little deeper than most, however. While explaining that the Convention would surely have failed if the numerous opponents of this evil had insisted on total abolition, a plausible case is laid out explaining how the antislavery forces could have prevented the above provisions from being incorporated into the final document. Basically, the states that fought hardest for these pro-slavery provisions, North Carolina, South Carolina and Georgia, threatened to not join the Union and become independent nations if the institution of slavery was not protected. The authors contend that this should have been considered an empty threat by the antislavery delegates, as at the time, these pro-slavery states were weak, under populated and beset by both internal and external threats. Thus, these states could never have gone it alone without the remainder of the country. Furthermore, the Colliers argue that had the pro-slavery provisions not been included, the institution of slavery would have been so weakened that it may have died out on its own and the American Civil War avoided. Finally, the authors take a look at America and its history. They starkly examine not only American successes, but also what they see as its flaws, including race relations, over-reliance on military solutions, etc., and they attribute a great many of both to the Constitution. Their ultimate conclusion is that despite its shortcomings, the American Constitution has been, in the past and up to the present, a triumph in both pragmatic accomplishment as well as democracy. Of course, this book covers an event of unprecedented importance. It does so in an understandable and extremely satisfying way. The writing is also very good. There are so many important points covered in this work. As often is the case, I have barely scratched the surface in relation to these topics. This is highly recommended for anyone with an interest the history of government, this period or American history in general. 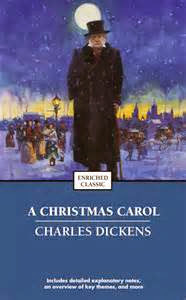 For the first time this holiday season, I have finally read Charles Dickens’s A Christmas Carol. The dilemma for me when composing this post was what to say about this ubiquitous Christmas tale that has not already been said millions of times over. Thus, instead of writing a comprehensive analysis or review, I decided to dig a bit and focus on a relatively small point. Though I doubt that my thinking here is unique, at least I will avoid general commentary on this tale, which from me, seems to be completely unnecessary. Instead I will write a few words concerning The Ghost of Christmas Present. Having read a fair amount of Dickens as well as little about him, I have a sense that his worldview usually reflects an easygoing, non - puritanical form of Christianity. I think that “easy going” is particularly important in this instance, as this most interesting spirit seems to exhibit pagan influences. It seems to me that there are shades of Dionysus with a sprinkling of the Santa Clause myth embodied in this figure. This ghost exudes celebration and good cheer in a naturalistic sense. His bear chest and feet, wreath and icicle adorned headgear, and free curls exude a sense of wildness. There is more then a hint of hint of hedonistic tendencies particularly connected with this character’s ever - present connection to food. The figure actually sits upon a throne of luscious foods and later shows Ebenezer Scrooge visions of even greater gastronomic excess. The ghost’s torch, which resembles “Plenty’s horn” has magical abilities to spread good cheer, and unsurprisingly, liven up meals. It seems to me that in the form of this ghost, Dickens is advocating a form of merriment and celebration that illuminates the Christmas Holidays connection with ancient winter festivals and feasts. Obviously A Christmas Carol also champions an entire range of values including charity, empathy and kindness. Dickens is examining what he sees as the positive aspects of humanity in great and diverse variety here. Pious virtues are extolled alongside extreme merriment and even a bit of excess. Without a doubt this remarkable character enlivens and adds spice to the famous story. It also adds an additional dimension to Dickens theme concerning the Christmas spirit. Of course the Ghost of Christmas Present is only a part of the tale that Dickens weaves here. His depiction reminds me that what we sometimes take as simple stories and lessons, are not always so simple. I just could not resist this one however. Having read and enjoyed these authors’ previous Game Change: Obama and the Clintons, McCain and Palin, and the Race of a Lifetime that covered the 2008 American Presidential election, I just had to delve into this foray on the 2012 contest. Both Halperin and Heilemann are pundits commonly scene on various American Public affairs programs. I must first comment that there is a stereotype that such programs are teeming with over opinionated talking heads propagandizing and/or yelling at each other. While such nonsense is indeed common, there are also plenty of programs, both on television and on the radio, that fly under the radar, where adults discuss, analyze and at times calmly debate issues. It is these types of programs that these particular authors frequent. This work is not about policy or substantive issues, instead it is about the art, perhaps better described as warfare, of politics. This book is almost entirely dedicated to the tactics and strategy of winning elections. Policies and ideologies are not judged here. To the extent that they are analyzed, it is done so in the context of how they effect elections. There is also a great emphasis on the personalities of both the candidates and the political operatives involved in the campaigns. All the candidates, potential candidates and campaigns are put under the microscope. This includes not just the Barack Obama’s and Mitt Romney’s operations, but most of the Republican primary participants including Rick Perry, Newt Gingrich, Michelle Bachman and their respective campaigns are scrutinized. The book is wonky and is filed with all sorts of details regarding the foibles and triumphs of its subjects. A key issue concerning a book like this is credibility. Every page is packed with information concerning conversations, strategy decisions, incidents, etc. that relate to the campaigns. There are mountains of really bad books concerning recent American politics out there. If it turned out that the authors included unverified or sketchy information the work becomes useless. Thus I would not read a book like this unless I knew a little about and researched a bit into its writers’ reliability. Based my knowledge gleamed from television programs, articles, as well as some online research, I do think that these writers have played it mostly straight and honest. 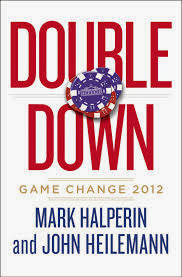 For both this work as well as the first Game Change, Halperin and Heilemann conducted hundreds of first hand interviews. They also amassed numerous first had sources such as emails, memos, recording, etc. The authors’ research seems to have been thorough and scrupulously involved a lot of double - checking. In addition, as someone who follows American politics and its controversies closely, it amazes me how little denials or rebuttals have been made by the subjects of these two books, even from those whom the authors’ have been relatively hard upon (I must point out that there are a few exceptions to this. However I think a work filled with this much information about such controversial topics must inevitably draw some fire. Sarah Palin was extremely critical of her portrayal in the movie version of the first Game Change Book, though a little less so regarding the book. The entire movie thing really muddles the issue as I think that the film did display bias that the book did not. The film also only covered a small portion of the book, specifically the part about Palin. As for that book, I thought that it actually painted a mostly sympathetic portrait of Palin.) Furthermore, these authors show no discernable bias for or against particular parties or ideologies. This book exhibits an interesting mix of cynicism and idealism. It is cynical in that it unsentimentally portrays a political world of bare knuckles brawling where all the stops are pulled out and little quarter is given. Almost all the participants are at times portrayed as doing questionable things. Furthermore, the influence of billionaires on American politics is shown to be pervasive and ubiquitous. All sides and candidates are shown to be unabashedly and openly dependent upon one faction or another of the super rich. The only good news in this respect is that the billionaires are not monolithic. There seems to be a group of billionaires that advocates for just about every position, including a few that want to reduce the influence of billionaires! Deep down however, it seems that Halperin and Heilemann are oddly idealistic. Just as the authors show politicians as flawed people, no one is demonized. Instead, the players are depicted to be people who believe. Almost without exception, all the participants, despite their warts, are humanized. Personalities of all those concerned are delved into in complex ways. Indeed, we are often confronted with overinflated egos, but this self - aggrandizement is based on a belief on the part of the egotistical, that they have amazing abilities to ultimately do good. Other times we see that these politicians will compromise smaller ideals for the good of the bigger picture and are thus accused of doing anything to get elected. There is truth to this, but a certain amount of compromise is also shown to be necessary. However, in the end, the name of the game is getting ideas implemented. Of course, this can be seen as a hunger for power, which, I think, is just another way of looking at it. The bottom line is that while plenty bad points of all the participants are revealed, so is a surprising nobility and virtue that manifests itself in both sides. I must point out that I find Halperin and Heilemann’s writing technique to often be poor. The book often alternates between various campaigns and at times the voice of the book takes on the attitude and tone of the point of view of the particular campaign it is focusing on. Thus, for instance, when writing about the Obama campaign the prose will sound biased and dismissive of Obama’s opponents. Conversely, when the focus shifts towards the Romney campaign, the opposite tone is assumed and the prose becomes biased and dismissive of Obama. Though the authors are scrupulously fair about this, I find this awkward and inappropriate. At other times the tone of the book is over the top snarky and filled with colloquialisms and slang that make the work seem sophomoric. This is a pity since this dilutes what in many ways is a fine chronicle of historical events. Though it is clear that the writers were trying to liven up the narrative and make the book fun, the above just does not work for me in a work such as this. Despite its flaws, I must admit that I could not put this book down. I am so easily enticed by a work filled with all sorts of insider information relating to American politics and the personalities that drive it. If one is expecting either side to be excoriated or glorified one will need to look elsewhere. Readers who absolutely despise pure political strategy will find this book frustrating but informative. For those very interested in American politics, and who are looking for hard, but at times refreshing truths, this is a very informative and entertaining read. In Paradise Lost, John Milton takes a stab at the seeming paradox of predestination versus free will that is inherent in Christian theology. The classic question is as follows: if God is omnipotent and knows the future, can it be reasoned that the future is set? If the future is indeed locked into place, how can humans have free will? Since free will is an integral component of most Christian belief systems, there is, on the surface at least, a problem. Which had no less prov’d certain unforeknown. It seems to mean that even if the future is set, it is the individual (in this case, Satan and his followers) who sets it. Thus, the mechanism of free will is still operating. Another way I look at it is like viewing the actions of creatures that exercised choice in the past. If I know a person robbed a bank last week, it is an inconvertible fact that the person robbed the bank; it is set into the universe that he robbed the bank. This does not alter the fact that the person exercised free will when choosing to rob the bank. Assuming that God is talking for Milton here, the conclusion is that the paradox of free will versus predestination is a false paradox. The two are not mutually exclusive. Though this is all a bit mind bending to me, I concur with Milton here. There are some scientific models that relate to the fields of physics and neuroscience which suggest that certain events and actions are set into our natures and the Universe and in a way are pre - determined, and that brings into question the role of free will in humans (These are neither universally accepted nor have they been proven.). Though not entirely congruous in comparison to Milton’s universe, in regards to these models, I find Milton’s reasoning enlightening and thought provoking. The other striking thing about the above passage is how eloquently and artistically Milton is able to communicate what are complex philosophical and metaphysical concepts. I find that one way sublime art is made is to take these big questions that are inherent to life and existence and express them in aesthetically satisfying forms. Even if one ultimately disagrees with what the author is getting at, the results here are still sublime.